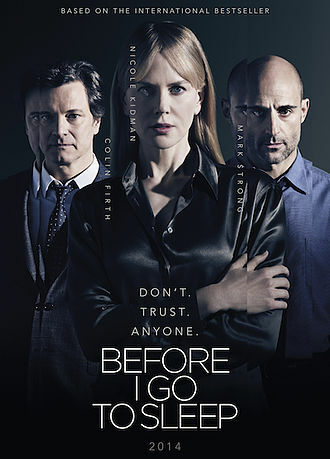 Based on the acclaimed best selling novel of the same name, this movie sees Kidman play a woman called Christine Lucas, who is suffering from retrograde amnesia following an accident. Every night when she goes to sleep all her memories are erased and she wakes each day thinking she’s 20, and has her whole life ahead of her. Her husband Ben (Firth) sticks reminders of their relationship and her life around their home, and is forced to explain who he is each and every day. However, unknown to him, and forgotten regularly by her, she is seeing a specialist called Doctor Nash (Strong) who gives her a camera to record what she learns each day, in order to help her piece her life back together. As she films her video diary, she soon realises that the truth hurts, and that she has no idea who she can actually trust. This has a tiny cast, and Kidman, Strong and Firth completely carry this film, with all giving decent performances. Firth plays a far darker character than we are used to, and it strangely suits him, while Strong is brooding and intense throughout. Meanwhile Kidman puts in a good turn as Christine, although at times she is far too breathy and simpering. There are plenty of twists and turns to this tale, as Christine tries to uncover the truth about her past and her relationships, and some clever scripting means that the audience completely shares in Christine’s confusion. However, the premise that she forgets everything overnight does become a bit repetitive as the movie wears on, and similar scenes are repeated over and over. Also, the final scene is somewhat of a sentimental anti-climax. Overall though this is stylish, smart and seductive, and it really draws in the audience. It keeps you engaged as you try to figure out the pieces of the puzzle of Christine’s life. Although predictable in places, the snappy editing ensures that you don’t lose interest, and ultimately, you want to know exactly what happened to Christine, to satisfy your curiosity as much as hers. ← EILE – September Issue OUT NOW!